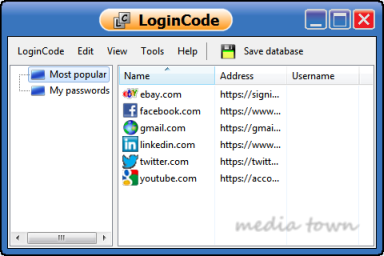 The central element of LoginCode is its main window. It is where you can add new items, log on to the websites etc. The image below shows the program ready to work. Main window contains two vertically split views. The folder view placed on the left shows you all folders stored in database and the item view on the right shows the content of currently selected folder. You can find various options in the View menu which allow to customize the style of item view. The Hierarchy option is somewhat specific since it hides the folder view and simultaneously shows all folders and all items in a hierarchical order. Both views allow for drag and drop operations. This way you can easily manage your database. To create a new web login item, select the folder in which you want to create it and click New web login item in Edit menu. The Web Login Edit window will be shown to allow you to define the item. To log on to the website it is enough to double click the item or click Log on button placed to the right of main menu. If you want the LoginCode to store a text information, you can use the text item which is designed to store any data as formatted text. To create such item, click New text item in Edit menu and then enter the name for newly created item. When you finish, you can double click the item to see or modify its content. LoginCode - Basic program tools. Launches the database wizard which allows you to define the database used by LoginCode. Shows a window which allows you to setup main database password. Saves the database to disk (not available when database is not modified). Allows you to import passwords from your web browser. Allows you to import data from external file. Allows you to export whole database to external file. Edit - Database edition tools. Creates a new folder and appends it to the folder currently selected. If there is no selected folder then the top level folder is created. Creates a new web login item in currently selected folder and shows Web Login Edit window which will help you to define the item. Creates a new text item in currently selected folder. Allows you to rename currently selected folder or item. If you attempt to delete folder then all its content will be deleted too. This tool has no "undo" option. Although if you accidentally delete some important data, you can still recover it by closing the program and answering "No" when LoginCode asks you to save the database. Then launch LoginCode again. Previously deleted elements will be available again. Shows a window which allows you to set a password for currently selected folder or item. This command gives you even better protection for most sensitive data. These options allow you to customize item view style so it fits to your preferences. In addition, view menu contains options which allow you to define a sort order separately for folders and items. Allows you to find an item by a typed in phrase. Shows a Password Builder window, which will allow you to compose any password containing randomly chosen characters. Shows a program options window. Help - Commands related to the program help. Shows the program help (this document). Shows general information about the program.